D+I take out three prestigious Design Awards, two Design Selections and the 2017 MAAS Design Award at the 2017 Australian Good Design Awards. D+I have continued our award-winning ways in 2017 with further success at Australia’s peak industry design awards — the Australian Good Design Awards. 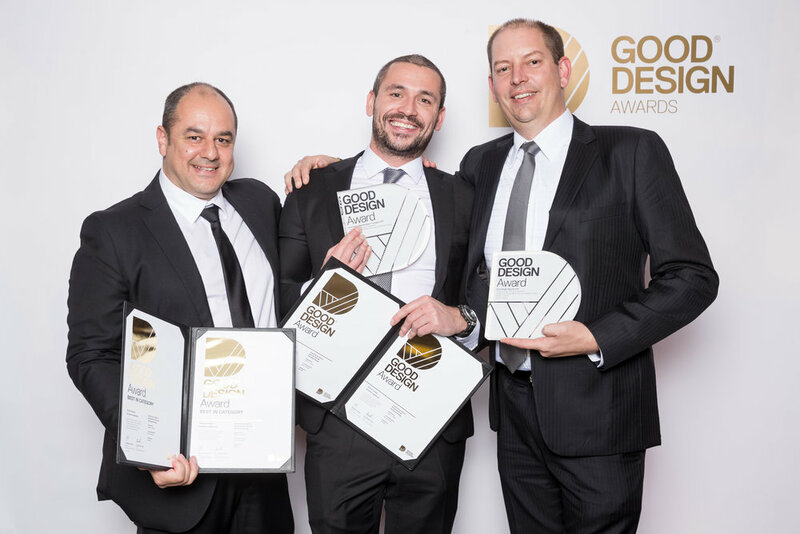 Our work with Shriro Australia on both the Everdure by Heston Blumenthal Charcoal and Gas Barbeque ranges was recognised with a Good Design Award for each in the Product Design: Domestic Appliances category. In addition, the Charcoal Barbeque Range was awarded Best in Category in recognition of its category-redefining impact on the global barbeque market. The Exoflex Hand Therapy and Assessment Device developed for BES Rehab also received a Good Design Award in the Product Design: Medical and Scientific category along with the Museum of Applied Arts and Sciences (MAAS) Design Award. Exoflex is a portable therapy and assessment device worn over the arm and fingers that works to bring movement to paralysed and recovering hands. These two awards come on the back of its win in the 2016 National Disability Awards. Good Design Selections were awarded to both the Redflex Halo Traffic Enforcement Camera and Opus Medical's Breathe Well. D+I client Schneider Electric also had success on the night with the Clipsal Iconic range of electrical accessories receiving a Good Design Award. D+I's Melbourne team developed the technical platform at the core of this innovate range of electrical products. The annual Good Design Awards is Australia’s most prestigious Awards for design and innovation with a proud history dating back to 1958. The Awards celebrate the best new products and services on the Australian market. The 2017 award ceremony was held on June 8 at the Overseas Passenger Terminal in Sydney, with a 'who's who' of the Australian design community in attendance. D+I were represented at the ceremony by David Jones (Head of D+I) and Rod Wiebenga (Head of D+I Melbourne).